Nottingham must have something special in their soil, fertilizing young male artists who have a knack for understanding the composition of great tunes. A KTC favorite, Jake Bugg, is a Nottingham descendent and now creeping up in the same city is Callum Burrows (Saint Raymond). Burrows is faintly following Bugg’s footsteps, though being the sole supporter of HAIM on their European tour is quite substantial. Musically the two differ with Saint Raymond having an electronic pop sound as opposed to the folky-guitar. Even with the mainstream feel, Burrows seeps natural talent that is never covered by trinkety beats and clapping, his abilities seem to just swoop around them. Saint Raymond released a previous EP (Escapade) last spring and now he is moving on to the sophomore, despite fans wishing for a full length album. Young Blood is a four track package with a release date of January 21st that is graced with delightful melodies that have you singing along within a few listens. This EP doesn’t take you long to get attached to, one listen and you’re hooked. You have this feeling it’s phenomenal before registering how many songs you even listened to. The single and self-titled track “Young Blood” would have fit nicely in KTC’s Summer Set List right alongside Smallpools and The 1975. With the instant introduction of keys and claps you suddenly desire being drenched in the sun, letting all of your worries scamper away during the echoing of the chorus. Of course, this instant musical blast into the summer will be reality to those in Southern Cali and us in New England? Well, we’ll just have to close our eyes and visualize. The three previous tracks follow along an English countryside path, into dark and cozy pubs as twilight descends, and lingers in friendships and strangers helping create memories along the way. Burrows’ storytelling through pop infused and delicate vocals invites you to follow along in his journey, reliving moments that may or may not have been in your past. “As We Are Now” is a casual walkabout with guitars taking a lead in an acoustic performance, though his diverse melodies keep transitions friendly and intriguing. The second track, “Bonfires,” begins in a similar fashion until picking up speed with the introduction of drums. Burrows also moves around within his vocal range, approaching sexier destinations. Perking up my ears as the mood peaks is “Threads,” not to be confused with Now Now’s “Thread,” deliciously explaining Burrow’s situation in a quiet fashion until you’re carried into an up-tempo little pop number. Moods are kept in good spirits, you’ve enjoyed your journey, and you’re ready for more. 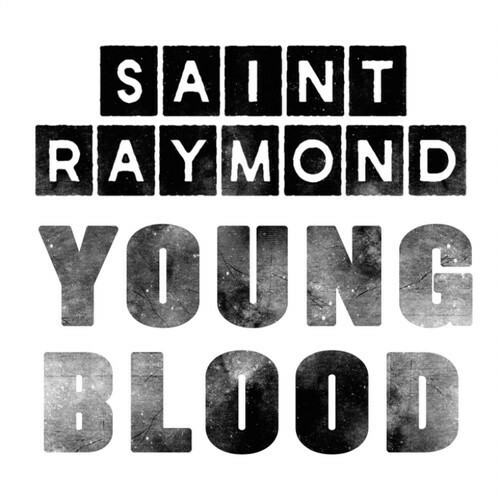 Saint Raymond’s Young Blood has just the right amount of style and smiling reactions to keep them on our radar for the full length album as we sing and dance around to four lovely songs.